How to dance the disco (boogie)? How to dance the quickstep? Why have shoes a heel? * In most of the dancing schools, 1 or 2 times per year. Ordering the same pair of shoes again may work by the Internet, but otherwise it is nevertheless necessary to feel effective two pieces effective at your feet. A steel brush to clean the soles you will find at the same supplier. A pouch to store the shoe you get there usually (free). A carrying case is also useful. 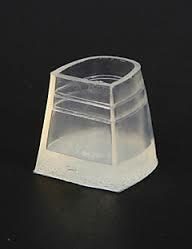 For narrow ladies heels there are also transparent set up parts, transparent plastic high heel covers/protectors. And for sore feet a gel pad sometimes helps. Shoes come in two categories: Ballroom and Latin American. Both have suede soles (see bottom of this article). Ballroom shoes for men are made ​​of leather and have a low, wide heel of 1 inch (= 2.54 cm). Ballroom shoes for women are the type of court shoes with low heels to 2 inches, which are also made of other materials ​​so that they can be better colored. The low Ballroom heel distributes the weight of the dancer over the entire foot. For Latin shoes the soles are more flexible. They have higher heels in order to concentrate the weight of the dancer more on the toes. The heels for men are narrower and higher, 1.5 to 2 inches for women 2.5 to 3 inches, often with open toes and straps. For men there are shoes. Elegant, dense and low-cut footwear without closure and (high) heel (no stiletto heel). The pump name was derived from the sound the shoe makes when you run on a wooden floor. Pumps were late eighteenth century a popular dance shoe for both men and women. Then, the heels became higher and it became a shoe for women. They are considered to be easily portable, graceful and elegant shoes. In 1951 introduced Charles Jourdan a new style, the stiletto heel. It is based on the pump, but the toes were opened, the top cut open or styled in a V and the heels spiked. The (needle) spikes (or high heels) are between 5 and 18 centimeter high. The original loafer was developed in the 30s by George Henry Bass, who gave the band over the arch the shape of a pair of lips. This opening was soon used to put in amongst other things a coin. Hence also called penny loafer. In the eighties popular low shoe with round toe and wide heel. A female ballet shoe inspired by the slip on shoes in many materials. They have a flat sole, closed toe and low cut. Originally a low slip on shoe of Hispanic origin with a top rope of woven grass and a flexible sole. Nowadays with a wedge (full, continuous heel) and long ankle straps of fabric. Children, girls or women's shoe with a strap across the middle of the entry opening. Sometimes multiple, intersecting straps too. Short, round toe and low heel, but now with a lot of (different) variations. Originally an Indian soft leather boot. The one-piece leather sole is stitched to the shaft and decorated with stitching. In some parts of Asia, Eastern Europe, Middle East and Africa, Northern Europe and Canada, and Alaska, it is customary to remove shoes when entering a home. (Unless the host specifically invites to keep the shoes on). This to keep out dirt, mud or snow. In some places in Asia in-house footwear can be provided for guests. In the Middle East, parts of Africa, Korea and Thailand, showing soles to others (even accidentally, such as by crossing the legs) is considered as rude and very offensive. In Thailand it is an extreme insult to touch someone's head with the feet, socks or shoes. is a type of leather used to produce boots, clothing and other textiles, such as bags. The name comes from the French "Peau de Suede", "Swedish leather”. Suede is made from the inside of leather, which does not show the cuticle (epidermis). This makes it less durable but softer than ordinary leather. Suede has a brushed texture and appearance like fabric, which makes it suitable for the manufacture of clothing. Nubuck looks like suede but is lightly sanded on the top of the skin, leaving a velvety look and feel. Nubuck is thicker than Suede and is therefore often used for footwear. The open structure of the suede gets dirty and it is susceptible to food stains. Since it is not possible to wash, it should be cleaned with suede cleaning machines, which, however, is not recommended as it also allows faster wear.